Sonya Peres, wife of Israel's President Shimon Peres, will be buried tomorrow in Ben Shemen. She was 87. Sonya Peres (nee Gelman), wife of Israel's President Shimon Peres, has passed away at the age of 87. Despite her husband's lifelong public presence, she preferred to avoid the limelight and was essentially unknown to the public. Mr. and Mrs. Peres were born in Belarus and the Ukraine, respectively, and met each other after they made Aliyah. They were married in May 1945 and had three children: Tzvia Valdan, a linguist and professor at Beit Berl Academic College; Yoni, director of Village Veterinary Center at Kfar Hayarok near Tel Aviv; and Chemi, director of a large venture capital fund. The three have given the Peres' eight grandchildren and two great-grandchildren. 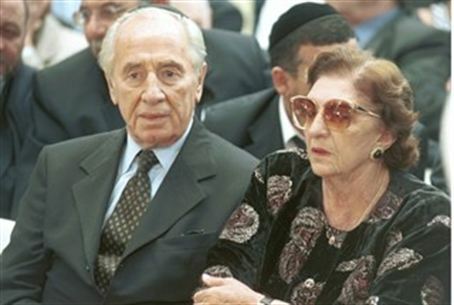 Not in the best of health of late, Mrs. Peres preferred not to move to Jerusalem with her husband when he became president in 2007, and remained in the couple's northern Tel Aviv home, where she passed away on Thursday. Mrs. Peres will be buried on Friday at 11 AM in the Ben Shemen Youth Village cemetery. President Peres will be sitting shiva at his official residence from 4 PM until 8 PM next week, and he and his family will sit shiva in their northern Tel Aviv home each morning from 10 AM.